If you’ve ever had the impressive motivation to enter a gym, or wandered around the sports and fitness section of a department store, you’ll probably have seen one of those exercise machines upon which you place each foot on a separate pedal and swing your legs back and forth one after the other. Their proper name is a ‘gravity strider’ or ‘airwalker’ and they provide the same fitness benefits as a brisk walk; the bonus being that you don’t need to worry about the weather. You can even position it in front of the t.v and do it whilst you watch The Simpsons, if you really want. Its really quite novel. Sometimes, when I see these machines in full swing, they remind me of the motion of our minds a little bit. Sometimes we are forward thinking in the future, other times we are backwards recalling the past, but seldom are we in the centre – the present. Ahhh, tenses. Everybody loves to philosophise over the tenses. You’ve probably heard dozens of infamous sayings about how important it is to live in today rather than yesterday, or tomorrow. Even one of the best-selling books of all time (Eckhardt Tolle’s ‘The Power of Now’) was about that very idea. For many, it is seen as the key to being spiritually sound and happy – and that’s an idea that most people would find extremely hard to refute. I’m not going to refute it either, though I am going to try and figure out whereabouts in the jigsaw the past and the future really belong. It seems to me, that most of the time we are thinking about things that happened in the past, or speculating over the things that we think may happen in the future. If you’re anything like me – the above phrases will be most familiar to you. You probably have a number of different words you could fit instantly fit into the ellipses. Its fun isn’t it? Reminiscing the good times and speculating over the exciting times ahead. It can also be extremely nauseating – regretting over things you may have done or said which you just can’t change, and never will be able to change, or missing things that you can never re-live that pale in comparison to whatever you’re doing now. Looking forward can be just as nauseating – you can set out many plans and goals but you can’t be certain that you’ll ever be able to enjoy the glory from them. A lot of time wastefully invested into thinking about something which might not even happen! Sometime during the third year of University, we were in the middle of a Criminology lecture which was not the most interesting of all. In fact, it was so boring, that I cannot recall the proper name of the module nor what topic we were learning about that rainy Friday afternoon in the Marcus Merriman lecture theatre, Lancaster University. I merely remember being sat with my unkempt, spotty, studentified head face down on the desk in despair, stomach full of Pot Noodle and Snakebite, trying in vain to battle the zzz’s. That was until our lecturer, Professor Can’tRememberTheName, used an analogy to describe something which really stuck out in my head as describing a habit that most of us have. The analogy was that of a boat on an open sea that was being manipulated by several different steering wheels, all trying to steer in different directions. The result? The boat stood still, and went nowhere. See yourself as the boat now, sometimes living in one direction (the past), other times living in the other (the future). The result? Staying still, going nowhere. Could you ever contemplate that a boat and an airwalker and even an human mindset could have so much in common? The present is the only tense that we are ever assured of having. Therefore, it needs to be the one which we prioritise. Yesterday is not the present. If today is Monday, even the soon to arrive Tuesday is not the present. Now is the present. Your eyes on this sentence is the present (I must say, you are using your present wisely at this moment), but now that sentence becomes the past and now this current sentence is the present. So let’s use it. Let’s do the things we want to do whilst we know we can. But where does that put the past? Where does it put the future? You definitely need those as well. Just ask Ebenezer Scrooge in Dickens’ ‘Christmas Carol’. We can only ever put our lives into perspective and make the most of ourselves if we can have visions of all three. The past is our teacher and Hindsight is that annoying fellow student in class who would start saying the answer to the question just after the teacher had started saying it, and would then pass off the answer as their own with a fraudulent grin. The past gave us immense pleasure and intolerable pain but still we stand; now with more knowledge, appreciation and wisdom. The past gave us all of the people we care about and all the qualifications we have. We would be nowhere without it. Be careful not to dismiss it. Though there may be things we don’t like to remember, sometimes it is those things in particular which taught us the most. Everything we ever did, taught us something, even if it was only trivial like, “don’t hold on too firmly to the escalator handlebar or you’ll spend the rest of the day with traces of hard-to-remove black rubber on your fingers”. To dismiss any of that just because its not happening right now would make a mockery of everything you ever experienced. Then too, the future – the one that keeps us facing forwards. Thinking about the future is what provides us with hope and excitement. Having a bad day? TOMORROW WILL BE BETTER. Though the uncertainty may also scare you, but at least you have the time to try and guide yourself in the direction you want to go in – draw out that map! Plan your route. But don’t use it as ‘back-up’ time to fulfil the things in life you really want to fulfil. There is no tomorrow. Nobody ever goes there. Have you ever received a postcard from that golden, heavenly Land known as Tomorrow? There’s no wanting in the present. There’s no wishing in the present. There’s no regretting in the present. There’s only ever living in the present, so let’s not wait any longer to do the things we really want to and lets put the present in its rightful place at centre stage where it cannot be avoided; and the past and the future stored safely and discreetly in the wings for when we need that little bit of perspective or hope. Massively under-rated away from the Americas, mash-up D.J Gregg Gillis has been making creating fresh party anthems for masses through ingeniously blending together popular songs in a way that leaves you in a state of absolute awe… Once you’ve stopped dancing, that is. …It’s not really clear. 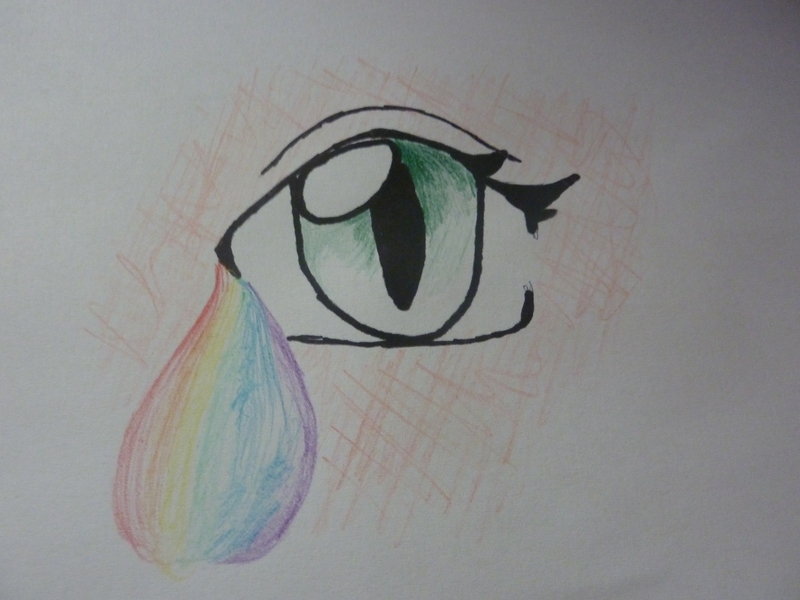 It’s a technicolour tear. A few weeks ago I published a post about love. I wrote about how, as humans, our ultimate desire is to find somebody who we can fall in love with, and share the rest of our lives with. I stand by that sentiment, but now I’d like to focus on the alternative state of being single. Is it really so bad to be unattached? Essentially, being single is something we need to learn not to be afraid of. Unless you’re lucky enough to have met “your one and only” already, then being single is a state you need to embrace, and even learn to like, as unattractive it may seem compared to the beautiful vision of unearthing your soulmate and falling in love. It’s strange how one of the things we fear most is essentially the one thing we feel as though we have the least control over – being alone. Nobody likes to feel alone. That’s why we have families; that’s why we have friends. We interact with others because we enjoy sharing stories and laughter with others. We like having people to care for, who will care for us back. Without this, we can feel lonely. We each need the occasional personal space to gather our thoughts, but to be in this state for too long can lead to derealisation – we could lose ourselves in our imaginations. And there will be days when the lack of a partner hits us harder than normal. For me, it only takes the vision of a pair of teenagers on the street, loved up and arm and arm, to hit that sensitive spot in my tummy and react, like a metal fork touching a filling, and taunt me, “Why haven’t you found that yet, Sophie?” “You’re getting older now, Sophie” or even just, “Stupid Sophie who nobody wants yet you’re about twice as old as those lovers”. It can lead me to remember those visions I used to have as a young child, writing out my dreams in class, “Wen I am 25 I want to b living in a house wiv my husband, 2 chilldren and pet cat”, and then I feel as though I’ve let my infant self down. However, my past paddles into the world of dating and relationships, which clearly all failed, have reminded me of one thing: Love is something that we cannot force, and we should not actively look for. Love is something so beautiful that it should come naturally. We cannot phone up and order it, like a pizza; and much like a distant vision on the horizon, it does not make its way any closer to us just because we use a pair of binoculars (or *cough* a dating website *ashamed cough*). We simply have to be patient, and wait, and whilst we do so, we need to find that inner peace in ourselves that says, “Hey, single? So what!” and allows us to continue having fun, and not let us feel inferior because nobody has fallen in love with us yet. Our eventual spouses will be the ones we have decided we love enough to share the remainder of our lives with, but let’s not forget about all the years of our lives that will have preceded that. Being single is our natural state from birth, and as humans we are an embodiment of a conscience. Our conscience is the one person we have in our life who we know will never abandon us – similarly, it is the one person that we can never escape from. Our conscience knows all of our secrets and all of our thoughts. It knows much more about you than the person you marry ever will. When you make a mistake it will be your conscience that makes you feel guilty. When you try your hardest at something, and nobody else seems to realise, your conscience will be the one person guaranteed to give you a proverbial pat on the back and say, “I saw you trying, even if they didn’t”. It is yourself, that listens to all of your thoughts and will never tell you to shut up, but it will also be the thing that does not need to be polite when telling you all the things that you have done wrong and what you need to change. With this in mind – why, when we are single, do so many of us, myself included, pre-occupy ourselves with the disdain of not having found a relationship yet, when even a future partner will not be as understanding of ourselves as…. Ourselves! A relationship with another stands for nothing if you cannot first enjoy the company of yourself. We can obsess about finding a relationship out of fear of being alone but listen to your heart – can you hear that quiet voice? That’s the voice that’s going to guide you, and never going to leave you. Do you still feel alone? I may wish for a relationship, but I cannot force it, nor would I want to. Being single should not be viewed as a negative quality in somebody. Rather, lets just remember the things we have, and not the things we want, and carry on living each day to the full until the time comes when love will find us. Emily Hutchison, since you asked, this one is for you!